After the second of our stopovers in France, the penultimate leg of our Man Booker International Prize journey takes us to Turkey, where we’ll take a trip into the past. Our guide is an affable fellow, a man who knows the streets of Istanbul like the back of his hand, and he’s happy to take us all around the Turkish capital and show us the progress its made over the past few decades. We’ll have to be patient, though – he just has a few more deliveries to make. A drink while we wait? Before we go any further, and to make sure that our story is properly understood, perhaps I should explain for foreign readers who’ve never heard of it before, and for future generations of Turkish readers who will, I fear, forget all about it within the next twenty to thirty years, that boza is a traditional Asian beverage made of fermented wheat, with a thick consistency, a pleasant aroma, a dark yellowish color, and a low alcohol content. While Mevlut enjoys his meandering routes through the city every evening, selling boza is never going to be a route to financial success, but while his cousins are able to thrive in the confusing, corrupt big city, our friend goes from one job to another, never able to make a go of his various endeavours. A Strangeness in my Mind stretches over around fifty years, allowing us to see Melvut develop from a well-behaved, ambitious schoolboy into a hard-working family man. Surrounded by hypocrites, thieves and liars, he stands out as a decent man and a loving husband. While he’s not as religious as he would like to be, he always tries to do his best, attending prayers when possible and avoiding the drinking and womanising that plague some of the outwardly more devout characters. As much as the novel is about Mevlut, however, it is just as much about the city, almost six-hundred pages on Istanbul’s development from a sizeable city to a thriving metropolis. Quite apart from the societal changes featuring successive waves of rural migrants creating shanty towns on the hills surrounding the city proper, Pamuk sketches out the way the city (and the country) becomes, on the one hand, more outwardly religious, while also falling prey to turmoil, with gang wars and drugs taking over some of the old streets. After half a century of organic growth, the contrast between ramshackle one-room houses and the towering blocks of flats which replace them is telling, as the three-million-strong population of Mevlut’s youth explodes to thirteen million. This era of change helps to explain Melvut’s almost-visceral need to walk the streets of the city. As a boza seller in the heart of the old town, he’s a living link to the past, and in the same way, following the routine helps him to feel a part of Istanbul, even if some consider him a relic. It’s on these nocturnal walks through the city that we see the importance of the title, with Melvut feeling that by walking the streets he’s actually looking inside his mind, helping him to find the strength to carry on his exhausting life. Life in a traditional Muslim environment has failed to teach many of the men of the novel how to attract, and cope with, a woman they can enjoy married life with, and while he may not have a lot of money, Mevlut’s respectful demeanour gets him a lot further than that of his brash cousin. 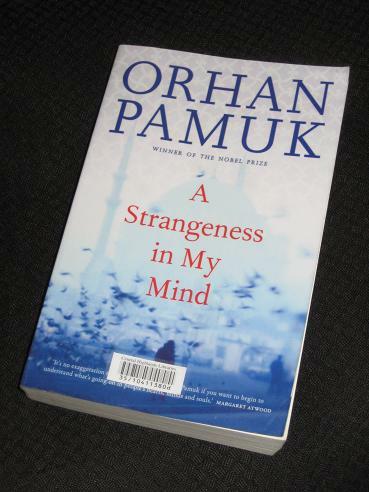 If you like the blockbuster novels of Victorian literature and have a passion for stories of faraway places, A Strangeness in My Mind is one for you. It starts very well, with the story of the elopement suddenly abandoned, with the main narrative only catching up two-hundred pages later. While it does sag a little in the middle (some of the family plotting can be rather dull), the final fifty pages or so, bringing a renewed focus on Melvut and his relationship with the city, finish the story off nicely. It’s always a comforting read, with the intrusion of characters into the narrative, commenting on the story (and occasionally bickering…), adding to the fullness of the story. The real beauty of the novel, though is the picture Pamuk creates of a changing city. When Mevlut walks the streets, filling the baskets of his customers with boza or yoghurt, or is invited to climb the steep stairs to ancient flats where extended families greet him, enchanted to meet a living piece of history, what we’re reading is Pamuk’s extended love letter to Istanbul. Incredibly evocative, these scenes conjure up images of days long gone, the cries of ‘boo-zaa’ ringing in the reader’s ears. No. In a strong year (and with a better Nobel-laureate-written book on the longlist), I really can’t see the judges putting this in their final six. It’s a funny thing about me and Pamuk. I really like some of his books, while others leave me cold. But even those I like (Snow, My Name is Red) seem too much of a good thing, a bit like overdosing on dessert. I need him in small portions, it seems. That’s a great comment – harsh but probably true. Still trying to decide if I want to read this one or not. I think both Snow and My Name is Red are much stronger than this, though it’s certainly not as poor as The Museum of Innocence. Pamuk strikes me as a writer who has simply become self-indulgent, particularity since he set himself up as Istanbul’s Dickens. It’s pleasant enough but far too long and amounts to very little. Proof that Nobel Prizes should only be awarded to very old writers! Grant – A fair comment (which means Murakami will be waiting for a couple of decades yet!). Great review 👍. I really enjoyed this novel because it reminded me of Patrick Modiano style & Sebald. I always enjoy “stream of consciousness ” type of novel. But, I agree with you that it’s not for everyone. It’s a journey and I felt Melvut’feelings palpable. This is my first novel of Pamuk I read. I’m planning to read “Snow” next. Anafiches de lectures – I’d love to try ‘Snow’ too – I just have another hundred or so books to get through first (plus all those that will arrive in the post while I’m reading! ).